Police detective Jane Rizzoli (Angie Harmon) and medical examiner Maura Isles (Sasha Alexander) are back on the trail of some of Boston’s most notorious criminals. The pair certainly share some quirky chemistry and their series, Rizzoli & Isles, is returning to TNT for season two on Monday, July 11th. Featuring the talents of Harmon, Alexander, Jordan Bridges, Lee Thompson Young, Bruce McGill, and Lorraine Bracco, Rizzoli & Isles debuted last July. The premiere attracted a 1.6 rating in the 18-49 demographic and 7.55 million total viewers. The subsequent installments dropped a bit but the 10 episode season still managed to average a 1.5 rating in the demo and 6.86 million viewers. That’s quite good by TNT standards and is essentially double what some of the cable channel’s other shows attract. 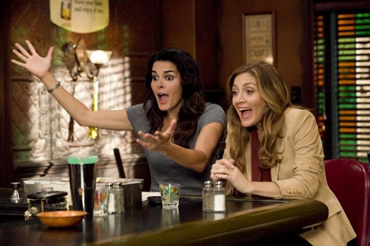 Rizzoli & Isles was renewed for a second season of 13 episodes in July. The first 10 installments will run over the summer months. TNT hasn’t announced when they’ll air the remaining three episodes yet. If they follow a schedule similar to that of Leverage, they’ll end up debuting some time next winter. What do you think? Are you glad to hear Rizzoli & Isles is returning? What do you like about the TNT series? Cannot wait until July 11! What a great show!!!! Bring it on!!! I love Rizzoli and Isles and cannot wait for it to come back. The Closer is also a terrific show, witty, serious, and have not missed an episode of these great shows which are too few and far between these days! I’m so happy its coming back! its one of the best shows. I have been waiting so long! So glad Rizzoli and Isles AND The Closer are back…..good going TNT!! I’m thrilled Angie & co.will be returning…..one of the best shows on TV…..I wish more quality shows were on the regular networks……..maybe they could sit up & take notice? Love the series! Can’t wait for season 2…. This is a great show. I wish they would give it 52 episodes per year. Sorry ladies. Maybe you do need some vacation. I’m really glad this show will return this summer. It’s well done and each episode is over too quickly! Glad it’s coming back. Can’t wait for it to start. I love the show. The characters are smart, witty, interesting and have a real personality. The writing is fast paced and clever. Billie Burke doesn’t hurt the story line either. Mostly, the rapport between the two female characters is dynamic. The heroines show that women can have both a professional relationship and best friend relationship without resorting to cheap sexual tricks. The show has a maturity you don’t find on the three stanard networks. Estatic! Love this show but worried it wasn’t going to come back. Every time there is a great new show on it just dissapears into the sunset. New show about a medical coroner aired on channel three. Its a cross between Jordan and Isles without the talent! Please keep this show on, it’s right up there along with bones and charmed. Before long I won’t ever have to turn the channel.